The Color or the Flower? Since this was a color challenge I used 'fuchsia' as the color but used a different flower in my design - the rose - which is, by coincidence, also a color. 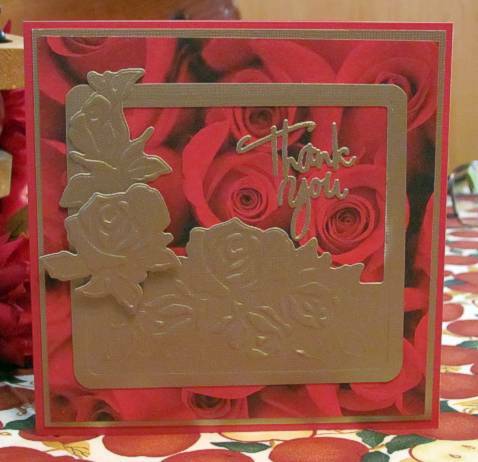 I started with white core cardstock and ran it through the Cuttlebug with a thin metal die to cut the rose elements. 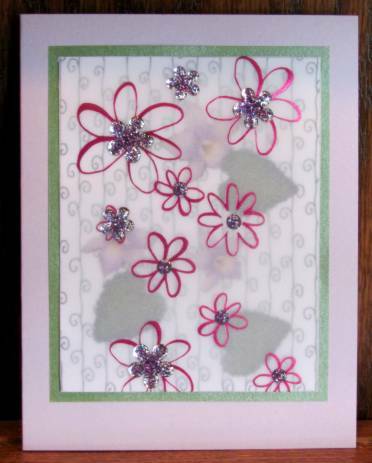 I added the rubber mat and used the same die to emboss the flowers. Then I sanded the surface to expose the white core, lending dimension. I had some printed cardstock and cut four strips to create a frame around the attached elements. The aperture is cut by the die. I added the separated elements to the front and the back of the attached element using foam tape. I added a piece of white-printed vellum behind the aperture and used a marker to color in some of the dots. I lined the area behind the vellum with a dark cardstock. I used the same marker to color some white corner stickers and added them. So, 'rose' or 'fuchsia' or what-have-you, there is my card for the color challenge. We could use the feature color plus either the top row of colors or the bottom row. I chose the top row. The way my computer is set up I have to write down the colors with descriptions and then try to find/match those colors when I get down to the studio. It's harder than it sounds! I started by selecting the Distress inks that I thought were closest (Squeezed Lemonade, Aged Mahogany, Weathered Wood and Dusty Concord). Then I chose cardstock to match those. In the end, I overestimated the intensity of the purple so my card is brighter than the palette supplied. 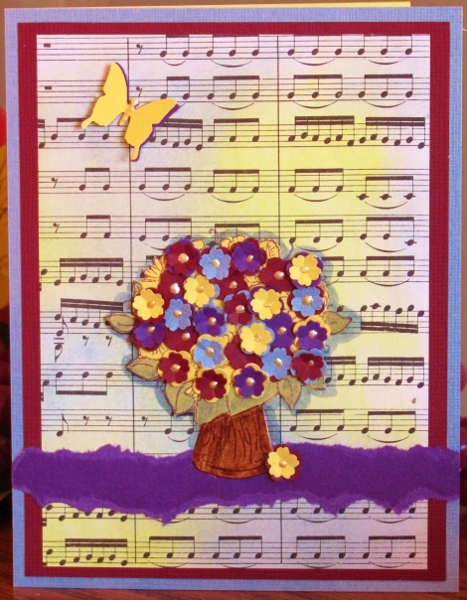 I selected a piece of sheet music and distressed it with the yellow and grey. Then I used the mahogany and grey as borders with a torn strip of the grape as an accent. I stamped a vase of flowers on yellow and cut it out. Then the vase and the leaves were colored with Distress markers. I used two punches to make tiny flowers out of all four colors of the cardstock, shaped them with a ball tool over foam, and stacked contrasting colors together. These were then glued over the whole bouquet. I then applied Liquid Pearls (Bisque) to the centers of all the flowers. I had used one flower as an accent at the base of the vase and needed something to balance that out. So I punched a butterfly from grape and from yellow and stacked them in the upper left. I added the same Liquid Pearls to the body of the butterfly. 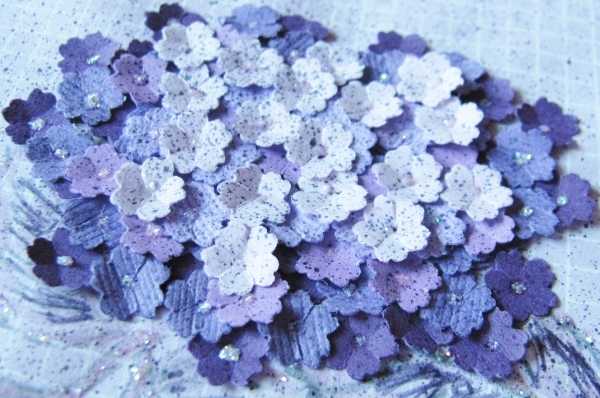 Have you ever tried to make a card using ONLY purple? That was the challenge I answered. 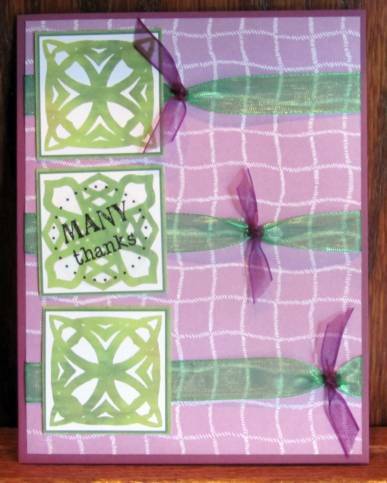 I first selected a checked background paper and stamped leaves and stem with a Milled Lavender Distress. I used Seedless Preserves Distress marker to sketch in some leaf details. With this background prepped, I punched a zillion tiny flowers out of five shades of purple. I then used a ball tool to shape them over a foam pad. Starting with the darkest flowers I attached a layer using Glossy Accents as adhesive. This was followed with a layer of the next darkest, not going all the way to the edges of the darkest. Continuing in this manner I used all the tiny flowers and finished with a dot of Stickles in the center of each. I also outlined the leaves and stem with Stickles. I used Seedless Preserves Distress marker and a spritzer to spray the whole surface. Here's a look at the many layers of flowers that make up this bloom. 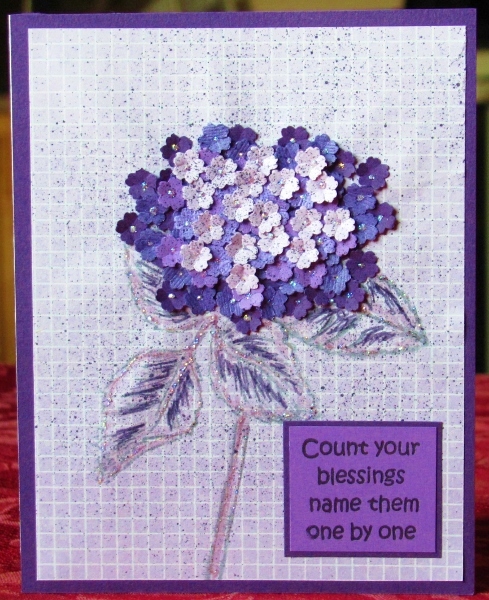 I finished with a stamped sentiment bordered with a dark purple the same as the border on the whole card. This challenge used four unusual colors together: Burgundy, Red Violet, Dark Blue and Pine Green. When the swatches were laid out together I had a hard time envisioning something harmonious coming out of that, but we were only required to use two of the colors. In sorting through scraps of designer paper I acrually found a floral with three of the colors in it! It was a corner treatment so I trimmed away the background with a craft knife and backed it with a solid burgundy piece. I added a red violet border to this and let all the green come from the illustration. By bordering the sentiment with the dark blue I actually managed to use all four colors. The sentiment is popped up on foam tape. We were challenged to use Blue and Tan on a card. I found a beautiful blue cameo in a jewelry catalog and a printed tag using the same color range of blue. Blues are hard to match up as they can go toward the gray, the red, the green, or the pastels. I was fortunate to find blues and tans in the table scraps that worked perfectly well and a folded card base that was great, too. These were layered in strips as a base for the tag, to which I applied blue distress ink before mounting. The tag also got a snippet of ribbon through the hole and two clear text stickers. Color Challenge: Make a card using only Red and Gold! This is harder than one might imagine - using only two colors. I also found that it was hard to find supplies in my stash that matched in the red category. In the end I was successful, I think - you be the judge. 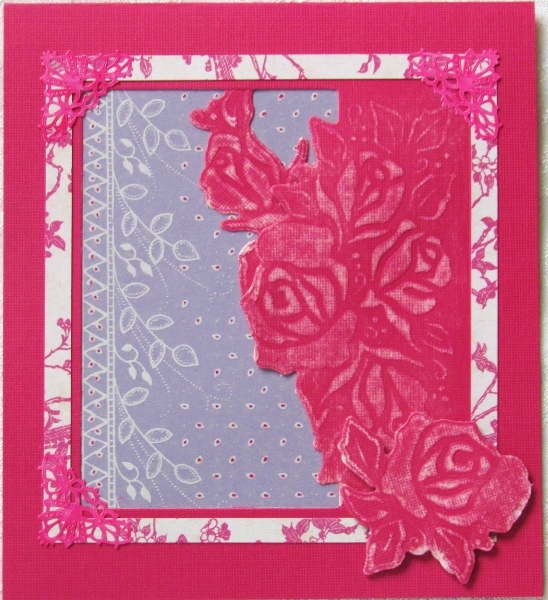 I started with a scrapbook paper printed with a photo of red roses. This was layered onto gold cardstock and these over a red folded card base. Then I used more of the gold and a Spellbinders Shapeabilities die to cut and emboss a rose frame and two separate roses. The frame was cut around the edges and the two additional roses glued over top along the left edge. The one in the center left is popped up on foam dots. Then I used a Cuttlebug die to cut the sentiment from the same gold cardstock and glued it inside the frame. I does not photograph as well as it looks in person. Well, I'm up for that. I pulled out a variety of supplies in the assigned colors and came up with three very different cards. 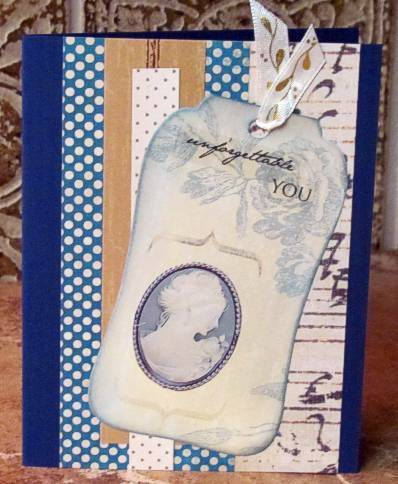 The first uses a square punch on printed medallions, background paper and two colors/widths of sheer ribbon. I used a clear sticker for the text in the center medallion. 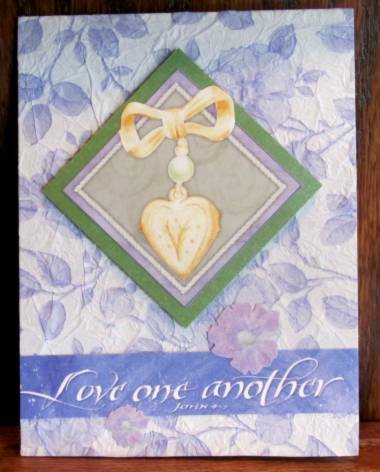 Next up is a card made with a metallic printed vellum panel recovered from an old greeting card. I applied some floral stickers to the base paper and attached the vellum over the top, wrapping to the back to adhere. I gave it a green shimmer frame and mounted on violet cardstock. The finish was to adhere glittery floral acrylic stickers and dots to the flower centers. Lastly, I used a large cardstock sticker and mounted it on a green frame of cardstock. I covered a green cardstock base with printed tissue paper and popped up the diamond piece on foam tape. 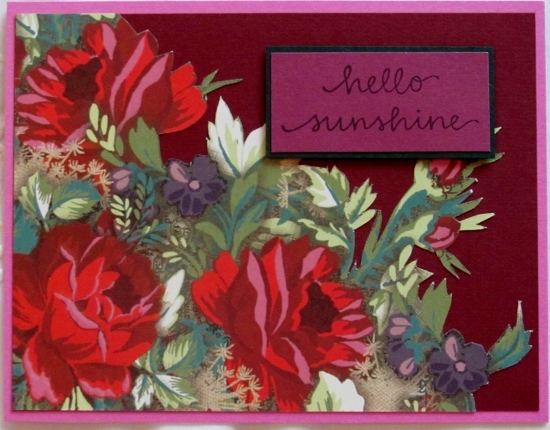 The text panel is a cardstock sticker and two additional floral stickers were added as accents. And that's the way you use Purple and Green.